A rejuvenated Kim Clijsters thrashed Germany's Sandra Kloesol to reach the second round of the Nasdaq-100 Open in Miami on Thursday. The Belgian - who won the Pacific Life Open last week in only her second tournament back after four months out through injury - won 6-0 6-1. 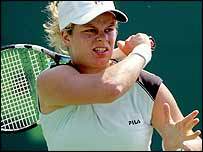 Clijsters is still ranked outside the seeded places at 38, with the top players joining the action on Friday. Maria Kirilenko and Evgenia Linetskaya were among other winners on Thursday. "It wasn't easy out there because conditions were very different to last week, so I'm very happy to have a short match," said Clijsters. "I tried to stay positive when I was injured and kept my body fit. Today the score was easy but I still feel that there is work to do."